The research presented in The Alphabet that Changed the World: How Genesis Preserves a Science of Consciousness in Geometry and Gesture was developed over 30 years under the auspices of Meru Foundation, a 501(c)(3) nonprofit in the United States. This website is owned and maintained by Meru Foundation. The Table of Contents of the book is posted HERE. We also plan to post additional professional and reader reviews, supplementary materials and references, errata, FAQ’s, and discussions of The Alphabet that Changed the World and the ideas it presents. Currently-available DVD lectures on this work can be ordered from the Foundation at www.meetingtent.com. *Your order from amazon.com can support Meru Foundation’s work. When you use this portal to order our book, or purchase any other item at Amazon.com, Amazon will send a small percentage of the cost of your entire purchase to Meru Foundation. When you enter amazon.com through Meru Foundation’s link, amazon tags your clicks with a code linked to Meru Foundation’s account. But some common ways to use amazon will remove this code. The key to making sure your order is credited to Meru Foundation starts with entering amazon.com using the link on this page, navigating to the product you want, and ordering and completing your purchase, all on the same visit. 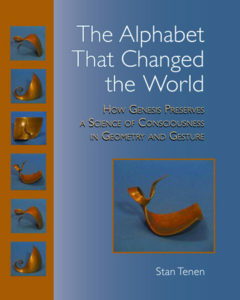 Enter amazon.com through the link on this page, which takes you to amazon’s listing for The Alphabet that Changed the World. Navigate to the product you want by using amazon’s search box. Don’t type or paste in the URL for your product: this will remove Meru’s code. Always use the search box. Click on the “order now” button for your product to put it in your cart. Important: If you’re ordering more than one of the same item, click the “order now” button again. (In other words, for 2 of the same item, click the button twice; for 3, click three times, etc.) If you wait until you get to your shopping cart and then change the quantity, only one item (the one you clicked the “order now” button for) will be credited to Meru’s account. If you want to order a second product, again, navigate to it by using amazon’s search box. You can navigate to and order as many products as you want.